Published: July 24, 2012 at 02:36 p.m. The new-era Cleveland Browns offense is ready to go. Rookie quarterback Brandon Weeden agreed to terms with the Browns on Tuesday, according to Mary Kay Cabot of The Plain Dealer, less than one day after No. 3 overall draft pick Trent Richardson signed his deal. NFL.com and NFL Network's Ian Rapoport confirmed the deal, according to a source with knowledge of the situation. Terms weren't disclosed, but Rapoport reported that the 28-year-old quarterback will receive a partial guarantee on the contract's fourth year. Weeden was drafted No. 22 overall in April, but his contract was a little more complicated because he's a quarterback. 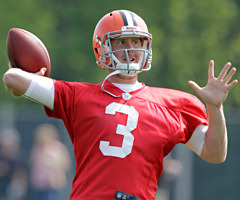 The Browns hope that Weeden is a true franchise signal-caller. Mike Holmgren's legacy as team president likely depends on it. The Browns are expected to hold a quarterback competition in training camp, but they're also expected to announce Weeden is the winner sooner than later. Colt McCoy could be an ex-Brown by Week 1. Weeden needs as many snaps as he can get with a shaky wideout group to prepare for a season in the NFL's toughest defensive division. So, yeah: It's good that he's in camp on time. UPDATE: The Associated Press reported that Weeden's contract is worth $8.1 million, according to a person familiar with the negotiations.